RATS! No, it’s not something you say when things don’t go your way. Instead, it describes, profoundly, what people think of this rodent that is perceived as a member of the underworld of the animal kingdom. They are scorned, feared and totally misunderstood. They are portrayed as evil and filthy little creatures that spread disease as they scamper through the sewers of major cities. Among unions, “rat” is a term for nonunion employers or breakers of union contracts. Few animals elicit such strong and contradictory reactions as rats. The Black Death is traditionally believed to have been caused by the micro-organism Yersinia pestis, carried by the tropical rat flea which preyed on black rats living in European cities during the epidemic outbreaks of the Middle Ages. These rats were used as transport hosts. Another disease linked to rats is the foot-and-mouth disease. The reason I bring this up is because of something I saw last week. My wife showed a video to me on Facebook – I don’t do Facebook – showing this woman who had two pet rats she had trained to do some amazing things. That piqued my curiosity because I had heard rats are fairly intelligent. The woman on the video had her rats trained to bring her a tissue when she sneezed, respond to flashcard commands, and even come when called, just to name a few that I remember. Those who keep rats as pets know them as highly intelligent and social animals who clean themselves regularly and thrive on regular interaction. Specifically-bred rats have been kept as pets at least since the late 19th century. Pet rats are typically variants of the species brown rat, but black rats and giant pouched rats are also known to be kept. 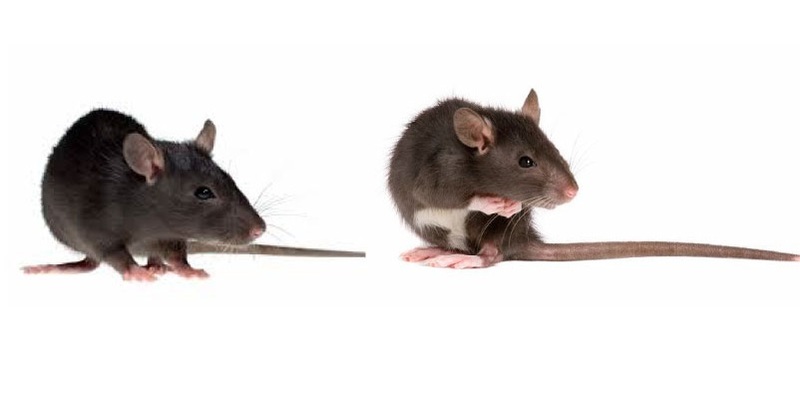 Pet rats behave differently from their wild counterparts depending on how many generations they have been kept as pets. The more generations, the more domesticated it will be. 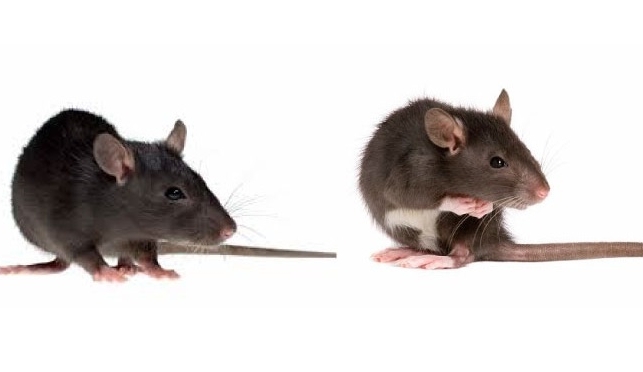 Pet rats do not pose any more of a health risk than pets such as dogs and cats. Tamed rats are generally friendly and can be taught to perform selected behaviors. Because of evident displays of their ability to learn, rats were investigated early to see whether they exhibit general intelligence, as expressed by the definition of a g factor as observed in larger, more complex animals. Early studies around 1930 found evidence both for and against such a g factor in rats. A 2011 controlled study found that rats are actively pro-social. They demonstrate apparent behavior to other rats in experiments, including freeing them from cages. When presented with readily available chocolate chips, test rats would first free the caged rat, and then share the food. All female rats displayed this behavior, while only 30 percent of males did not. Rat meat has become a dietary staple in some cultures. Among others, I personally observed rats being consumed in Vietnam, Cambodia and Thailand. Back to the pet rat. While most people cringe at the thought of having a rat for a pet, believe it or not, domestic rats make great pets. They are not aggressive, diseased and dirty animals, but in fact are very clean, fun-loving, sensitive, very social and affectionate. They genuinely enjoy interacting with people and should be handled daily. Rats are very intelligent and can be taught simple tricks, and will often learn their names. They can be litter box trained. Whatever you do, don’t go down to the river to select a pet rat, but rather visit your local pet shop. When choosing your rat, choose one that does not appear skittish or does not squeal when picked up. Males tend to be calmer than females. Males usually enjoy being held for longer periods of time, especially when they get older. If you get a pet rat, it is best if they are kept indoors rather than in a shed or garage, where they would get less attention. As mentioned before, rats are extremely clean animals and will constantly groom themselves – similar to cats. If you have more than one rat, they will groom each other. So, now that we have seen a lighter side of rats, doesn’t it make you want to run right out to get one? A scene from the film Fly Away Home. Let me begin this column by emphatically stating that I am not a film critic by any stretch of the imagination. I usually leave that up to Peter Cates, The Town Line’s esteemed reviewer. But I saw a film recently that truly inspired me, and because it is about geese, I think it fits the theme of this column. The name of the movie is Fly Away Home, and for those of you who have already seen it, you’re excused from reading the rest of this column. It was filmed in 1996, and dramatizes the actual experiences of Bill Lishman, who, in 1986, started training geese to follow his ultralight and succeeded in leading their migration in 1993. The story line of the film begins when Amy Alden, played by Anna Paquin, survives an automobile accident in New Zealand in which her mother is killed. The girl is sent to live with her father, Thomas Alden, played by Jeff Daniels of Dumb & Dumber fame, on an Ontario, Canada, farm. Her father is involved in a dispute with a local developer who is prepared to bulldoze some of the wilderness surrounding Alden’s farm. The crew begins to clear the land, but, for some unexplained reason, the project is put on hold. Amy goes out to the scene only to find a bunch of goose eggs left behind by their parents. Without anyone knowing, she takes the eggs to the barn where she uses a drop light to provide heat to incubate the eggs. To her surprise, they all hatched. The local game warden appears at the house and informs everyone that because of a local ordinance, he would have to clip the wings so the birds would be rendered flightless. This upsets everyone, and Tom throws the game warden out of his house, after which the warden threatens that if the birds fly, he would have to confiscate them. Tom begins to research the species and learns that if the birds aren’t taught to fly properly, as they have no goose parents to teach them, they would not survive during the Canadian winter, and would probably get lost and die. Once he notices the geese follow Amy wherever she goes, he decides to use ultralight aircraft to teach the birds to fly. The geese would not follow him, so he comes up with a plan to teach Amy how to fly, and the geese would probably follow her. Amy’s uncle Dave, played by Terry Kinney, travels to North Carolina to talk to a friend who owns a bird sanctuary about the plan. The friend thinks the idea is absurd, and also informs Dave that if the birds don’t reach the sanctuary by November 1, it would be torn down by developers who plan to turn it into a housing project. While the group is off trying to find a goose (Igor) that became lost due to injury while the Aldens were trying to teach the geese how to fly, the game warden confiscates the birds. But, through a clever plan, they reclaim the geese, and set off on their intrepid flight to North Carolina, breaking a lengthy list of laws during the journey. Some misadventures occur along the way, including an emergency landing at a highly-classified U.S. Air Force base on Lake Ontario, and Tom’s ultralight going down in a cornfield, only 30 miles from the destination, due to a faulty rudder. By now, Tom and Amy have become national news with residents cheering them on and offering places to stay during their overnight stops. Tom convinces Amy that she must go on alone, and she completes the journey safely. One of the most moving scenes in the film occurs when, while piloting through a cloud of mist, the office towers of Baltimore, actually shot in Toronto, suddenly materialize, and office workers see the little girl and her geese flying past their windows. While watching that, I felt a lump in my throat and goosebumps on my neck. In the final screen credits, it is revealed that all 16 geese, including Igor, who had been injured, and rode the whole way with Amy in her ultralight, returned to the Aldens’ farm the next spring, safely, and on their own. It is a heart-warming story as you get captivated by the dedication of the family, and the steadfastness of the geese. I highly recommend it. When was the last time the Kansas City Chiefs appeared in a Super Bowl? 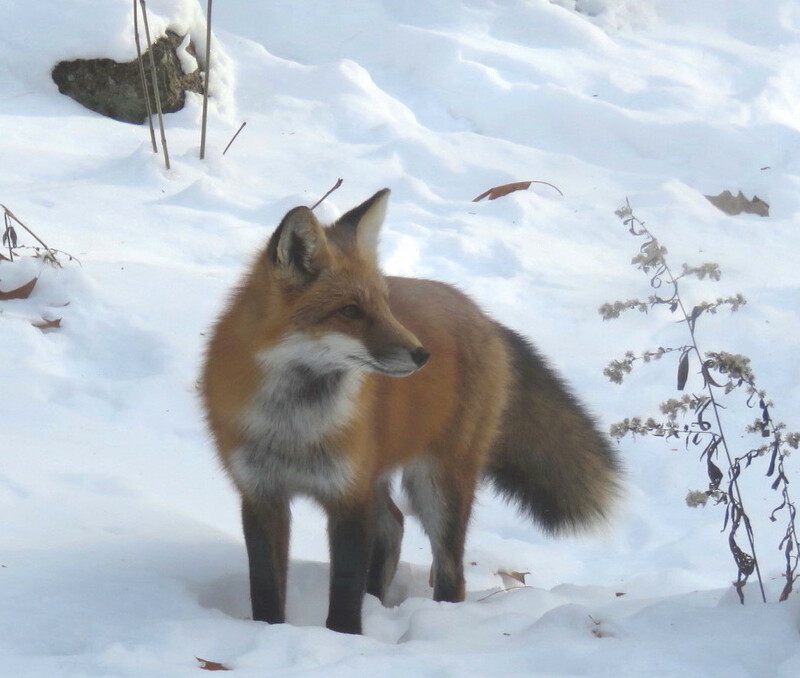 A week ago, Jayne Winters, of South China, sent along some excellent photos of a red fox that has been visiting her property recently. The photos were remarkable and deserved some attention. It’s been a while since we visited with red foxes in our area, of which there are an abundance. The red fox is the largest of the true foxes and one of the most widely distributed members of the order Carnivora. They are present across the entire Northern Hemisphere from the Arctic Circle to North Africa, North America and Eurasia. It is listed of least concern by the International Union for Conservation of Nature (IUCN). Since its introduction to Australia, it has been found to be a nuisance to native mammals and bird populations. Thus, it has been listed as among the top 100 worst invasive species in the world. They are somewhat shy and don’t like human interaction. Therefore, they will generally leave an area of increased activity. Two years ago, at camp, a family of red foxes had made its home under an outbuilding during the winter. 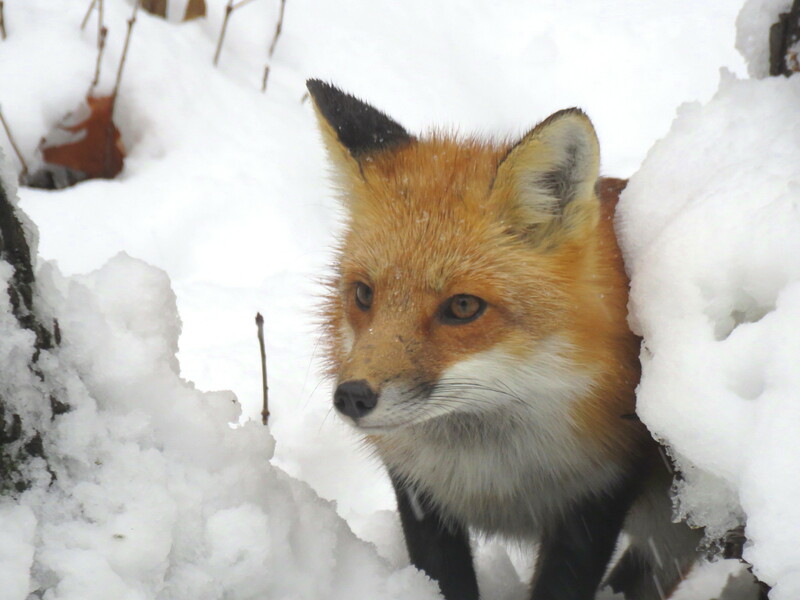 Once humans moved in for the summer, the red foxes vacated their den and moved on elsewhere. They either establish stable home ranges within particular areas or are itinerant with no fixed housing. They use their urine to mark their territory. 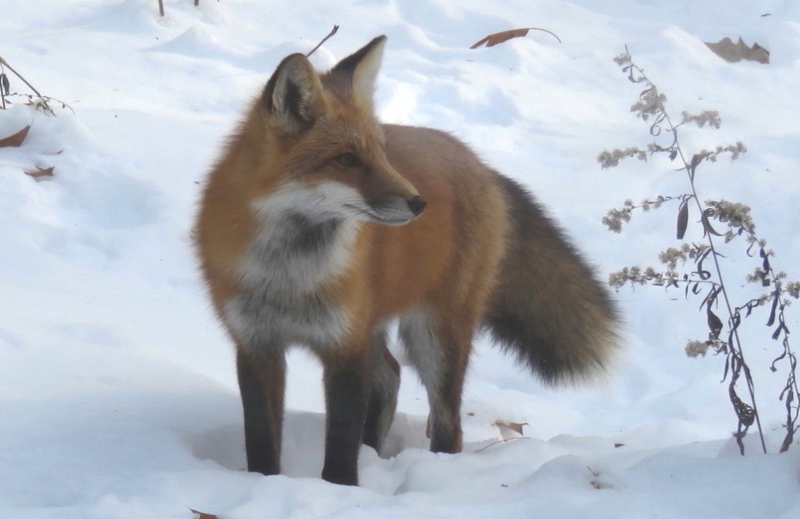 Outside the breeding season, most red foxes favor living in the open, in densely vegetated areas, though they may enter burrows to escape bad weather. They often dig their dens on hill or mountain slopes, ravines, bluffs, steep banks of water bodies, ditches, depressions, gutters, in rock clefts and neglected human environments. The red fox primarily feed on small rodents, though it may also target rabbits, game birds, reptiles and invertebrates. Fruit and vegetable matter is also sometimes eaten. Although the red fox tends to kill smaller predators, they are vulnerable to attack from larger predators, such as wolves, coyotes, and medium-sized felines. They prefer to hunt in the early morning hours before sunrise and late evening. Although they typically forage alone, they may aggregate in resource-rich environments. 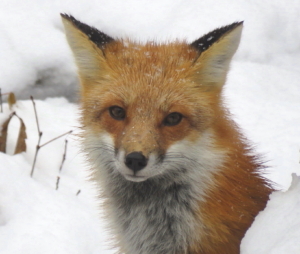 Losses of poultry and penned game birds can be substantial if you have red foxes foraging in the area. Their winter fur is dense, soft, silky and relatively long. For the northern foxes, the fur is very long, dense and fluffy, but is shorter. Red foxes have binocular vision, but their sight reacts mainly to movement. Their auditory perception is acute, being able to hear black grouse changing roosts at 600 paces, the flight of crows at three-tenths of a mile and squeaking mice about 330 feet. Their sense of smell is good, but weaker than that of dogs. 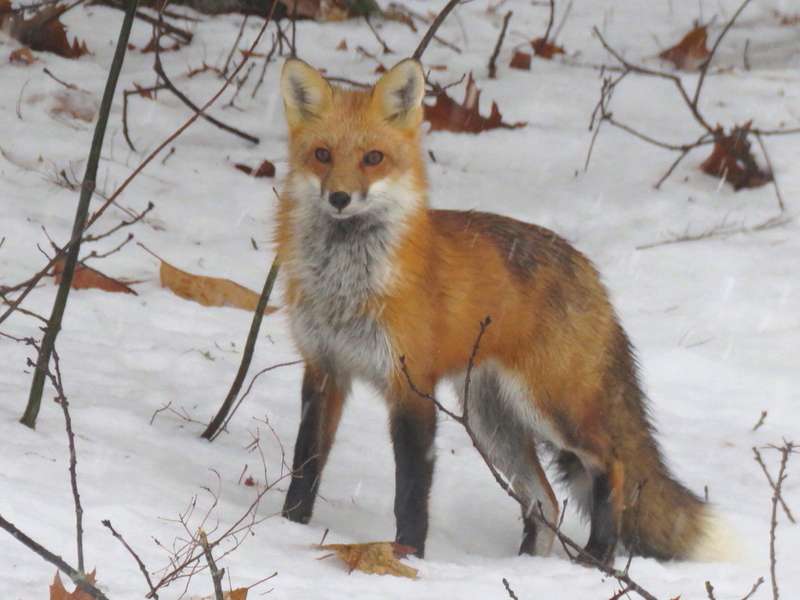 In recent years, I have noticed an increase in the sightings of red foxes in the area, particularly in the Cross Hill area of Vassalboro, near our camp. They have been heard howling during the late night hours. Their cries can be associated with that of an injured small dog. Like any other wild animal, they should not be approached if spotted. They have been known to carry rabies. Cute and cuddly looking, leave them alone. Name the six NFL teams to win the Super Bowl as a wild card team. SCORES & OUTDOORS – Why are skunks out this time of year: Are they true hibernators? 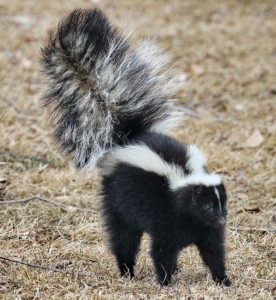 While driving to work one morning before Christmas – one of those balmy days we had back then – I could smell the unmistakable odor of a nearby skunk. As a matter of fact, I smelled it two days in a row. Strange time of year for skunks to be out and about. They usually go deep into their dens when the winter temperatures head south. A skunk preparing to spray. While growing up, I was told, by my grandfather, about the “seven sleepers.” Animals that “sleep” during the winter. Skunks were one of them. There are several animals that hibernate: skunks, bees, snakes, groundhogs and chipmunks. However, bears and bats are the most well-known. 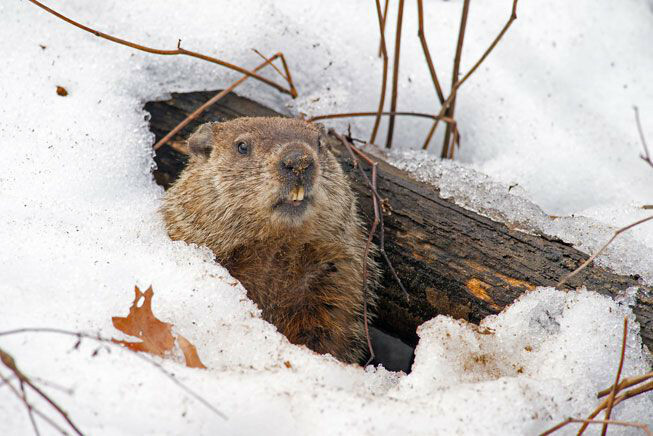 There are several ways that animals respond to winter: they migrate, adapt or hibernate. But hibernation isn’t as simple as going to sleep for a couple of months. Although there are various degrees and duration hibernation always involves certain changes for animals. Their body temperature decreases, their breathing slows, and their metabolic rate drops. It can be a lot of work, getting ready to hibernate. Many animals have to find or create that perfect, safe spot to bed down for months at a time, whether in a cave, a hollow tree, or a den dug into the ground. Usually, before hibernation, the animal has to increase its body fat to survive, which means eating much more than usual in the months leading up to winter. Although hibernation always happens in winter, many different things can act as the actual trigger for animals to start, including temperature drops, decrease in food availability, changes in day length and hormone changes. Bears enter their dens for hibernation based on changes in the weather. They generally begin hibernating in September or October and emerge six to seven months later around April. During hibernation, bears don’t decrease their body temperature as much as some other hibernating species. This gives them the ability to warm up more quickly in response to danger. Chipmunks hibernate in their burrows, their heart rate declines and their body temperature lowers until it becomes as cold as the temperature in the burrow. They have to raise their body temperature periodically, slowly raising it when it becomes time to eat from caches they established during the previous year. But recently, animals’ hibernation patterns themselves may be at risk. New studies have found that as the winter temperatures heat up due to climate change, chipmunks in these warmer areas are less likely to hibernate. This raises the question about how climate change is affecting hibernation, migration and other ways animals cope with the changing seasons. Spending a few months asleep may be a good way to get through the winter, but it’s not without its risks. If an animal isn’t able to store up enough fat, or find enough food after it awakens, it may not survive. And if a hibernating creature wakes up too early, they can burn through their fat reserves far too quickly, and die. Skunks are not true hibernators in the winter, but do den up for extended periods of time. However, they remain generally inactive and feed rarely, going through a dormant stage. Over winter, multiple females (as many as a dozen) huddle together, males often den alone. Often, they use the same den repeatedly from year to year. Skunks are solitary animals when not breeding, though in the colder parts of their range, they may gather in communal dens for warmth. During the day, they shelter in burrows which they can dig with their powerful front claws. Males and females occupy overlapping home ranges through the greater part of the year, typically about 1.5 square miles for females and 7.7 square miles for males. Although they have excellent senses of smell and hearing, skunks have poor vision, being unable to see objects more than about 10 feet away, making them vulnerable to death from collisions with automobiles. So, even though we are now in January and heading into the teeth of winter, beware of that skunk who may just be attempting to cross the road at night. Skunks are nocturnal creatures. The Green Bay Packers won Super Bowls I and II, and the New York Jets won Super Bowl III. Which team won Super Bowl IV? 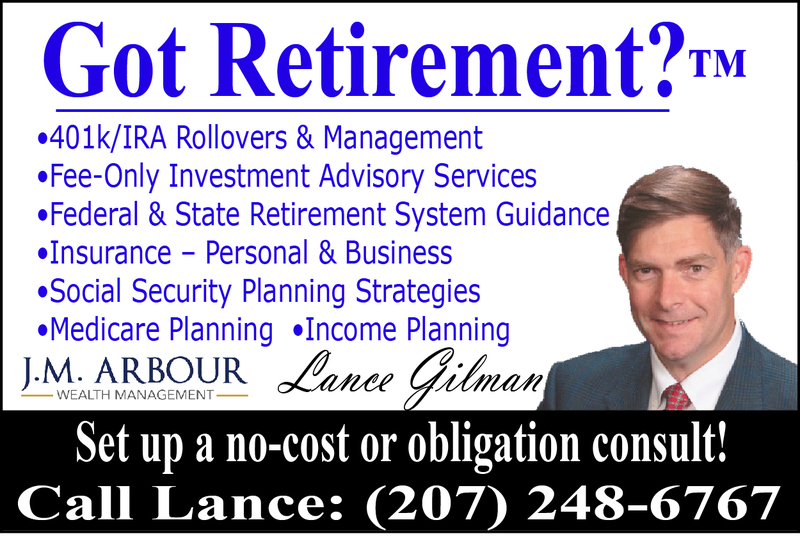 Answer on can be found here. http://townline.org/wp-content/uploads/2016/06/TownLineBanner-1030x206.jpg 0 0 Roland D. Hallee http://townline.org/wp-content/uploads/2016/06/TownLineBanner-1030x206.jpg Roland D. Hallee2019-01-02 15:21:472019-01-02 15:22:40SCORES & OUTDOORS - Why are skunks out this time of year: Are they true hibernators? SCORES & OUTDOORS: Is it Armageddon for the insects of the world? Some creep, crawl, fly and even sting, but research and anecdotal evidence concur, the population and diversity of insects on the earth has been rapidly declining in the past decade, and many are on the brink of extinction. And without a diverse population of insects, scientists agree the ecosystem will likely collapse. Although scientists are unable to pinpoint the cause, they believe the extent of the damage is likely the result of a variety of reasons, including insecticide use, light pollution, habitat fragmentation and climate changes. I remember the days when I used to constantly have to scrub the grill of my cars with an SOS pad to release the insects. Not any more. I can’t remember the last time I had to do that. Though observations about splattered bugs are not scientific, few reliable data exist on the fate of important insect species. Scientists have tracked alarming declines in domesticated honey bees, monarch butterflies and lightning bugs, as we have discussed in this column in the past. But few have paid attention to the moths, hover flies, beetles and countless other insects that buzz and flitter through the warm summer months. Hover flies, often mistaken for bees or wasps, are important pollinators. Their numbers have plummeted in nature reserves. Over time, the Krefeld Entomological Society has seen the yearly insect catches fluctuate, as expected. But in 2013, they spotted something alarming. When they returned to one of their earliest trapping sites from 1989, the total mass of their catch had fallen nearly 80 percent. Perhaps it was a particularly bad year, they thought, so they set up the traps again in 2014. The numbers were just as low. Through more direct comparisons, the group found dramatic declines across more than a dozen other sites. While it may be difficult to get excited about combating the loss of insects, this ecological disaster may ultimately affect your food prices at the grocery store. Insects not only pollinate crops, but also contribute to pest control, and are crucial to waste management and biodiversity. In fact, most waste in urban areas is eliminated by ants and cockroaches. Species that rely on insects as their food source, including predators that rely on these animals further up the food chain, are likely to suffer from the declining number of insects in the ecosystem. We may be underestimating the importance of insects, which make up approximately 70 percent of all animal species. For instance, the spotted flycatcher, a specialist predator of aerial insects, has declined in number by more than 95 percent. 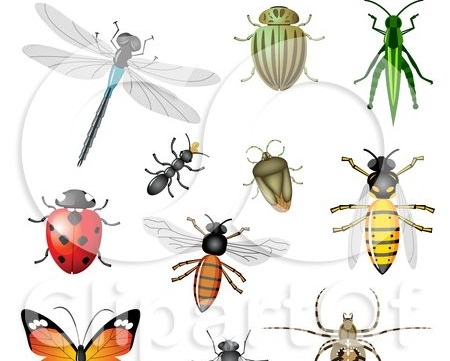 The link between insects and the number of bird species was again confirmed in a study by the University of Aberdeen. A study by Canadian biologists suggests bird species that depend on aerial insects have suffered a greater decline in recent years than birds feeding primarily on seeds. http://townline.org/wp-content/uploads/2016/06/TownLineBanner-1030x206.jpg 0 0 Roland D. Hallee http://townline.org/wp-content/uploads/2016/06/TownLineBanner-1030x206.jpg Roland D. Hallee2018-12-19 14:20:342018-12-19 16:06:28SCORES & OUTDOORS: Is it Armageddon for the insects of the world? 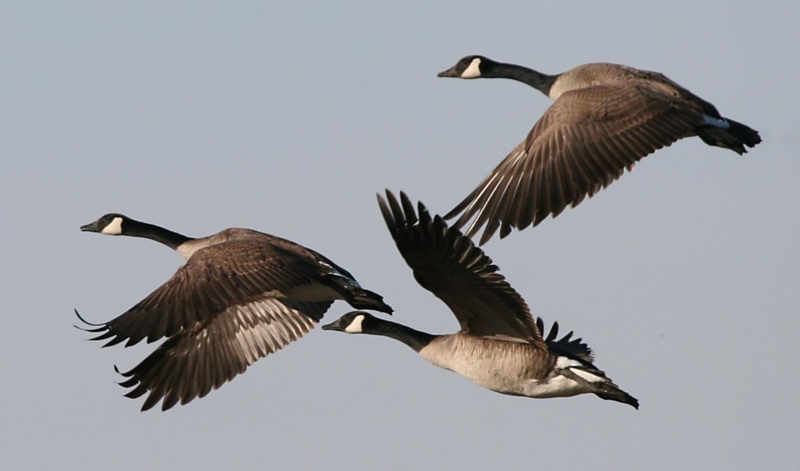 Why are Canada geese flying north in December? According to the Cornell Lab of Ornithology, there are several possibilities, but in fall it’s likely these are family groups moving around, now that the yearlings can fly, in search of feeding grounds. Canada geese raise their young near water, where the goslings can feed and, if necessary, dive or swim away to escape predators. In late summer the adults temporarily become flightless as they molt their wing feathers. This usually takes about six weeks, during which the geese remain grounded. Once the young have learned to fly, and the parents have regained their flight, the whole family will take off from their nesting grounds to find more productive feeding areas – and this movement could be in any direction. This happens in the late summer before the massive southward migration as temperatures drop across the continent. First and second year geese (not old enough to breed), along with those that lost nests early in the breeding season also undertake a molt migration. Individuals may move several to hundreds of miles during the late spring and summer to large bodies of water where they will be safer as they molt their wing feathers. In September and October many of these individuals will be returning from this seasonal journey, and again may be seen flying in almost any direction. Also, bear in mind that there are increasingly large numbers of resident Canada geese across North America. These birds do not migrate at all, and so you may see them at any time of year flying in any direction. Their numbers have been growing exponentially since the mid-20th century and they have begun to be seen as nuisances in some communities. Our friend noted that these geese were in their flight V formation, and there were three separate groups. Johnnie St. Vrain, of Times-Call, states that what she may be seeing are geese that decided this is as far south as they needed to go. They probably came from further north in Canada. They’ll spend the night on a relatively large reservoir or lake where they feel safe. In the morning, they’ll fly out to whatever feeding grounds they have. They might be flying to a local park or to a nearby cornfield. If their feeding ground is north of their roosting area, you’ll see them flying north in the morning, but you might miss them heading back south that evening. Some of these winter geese fly in from neighboring states. Others fly down from the mountains to spend the season in front range cities. Geese are pretty well adapted. They will fly only as far south as they need to make a living. Historically, most Canada geese would migrate through this area, with very few sticking around. But agriculture, specifically the grain left in farmers’ fields, has caused geese to spend winters here. The geese that fly north-to-south in fall are less noticeable. They fly a couple thousand feet high. But locally, large numbers of geese will sit out on a lake. Their warmth will keep the water open. The geese might move when we’ve had really cold weather and a lot of the lakes around here ice up and become unavailable. But we have enough warm days, that if there’s enough geese hanging out, it will create holes they can stay in. Or they’ll stay on the river, but they don’t like that as much. Our friend lives on the river in Fairfield, probably why she sees these flocks of Canada geese flying north. There are many cornfields north of Fairfield. It may be worth paying a little more attention to see if they return at night. The New England Patriots have appeared in 10 Super Bowls, the most in NFL history. Name the three teams that are next with eight appearances each. 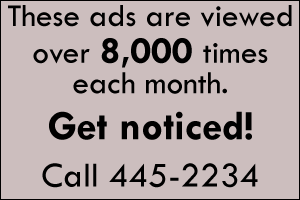 http://townline.org/wp-content/uploads/2016/06/TownLineBanner-1030x206.jpg 0 0 Website Editor http://townline.org/wp-content/uploads/2016/06/TownLineBanner-1030x206.jpg Website Editor2018-12-12 17:51:312018-12-12 17:51:31Why are Canada geese flying north in December? SCORES & OUTDOORS: Just what, exactly, is a killdeer? Since we began a two-part series on the former Killdeer Lodge, in China, in this week’s issue, why don’t we find out exactly what is a killdeer. It’s probably one of the most misnamed creatures. They are birds, they fly, and they don’t kill deer. The killdeer feeds primarily on insects, although other invertebrates and seeds are eaten. It forages almost exclusively in fields, especially those with short vegetation and where cattle and standing water are found. It primarily forages during the day, but during the non-breeding season, when the moon is full or close to full, it will forage at night. This is probably because there is a larger abundance of insects and reduced activity by predators after dark. Predators include various birds and mammals, most notably herring gulls, common crows, raccoons, and striped skunks. They prey in some areas during the breeding season. Predation is not limited to eggs and chicks. Mustelids, fur-bearing mammals like weasels, martens, skunks and mink, for example, can kill incubating adults. The bird is classified as least concern by the International Union for Conservation of Nature (IUCN), because of the range and population; however, its population is in decline, but the trend is not severe enough for the killdeer to be considered a vulnerable species. It is protected by the American Migratory Bird Treaty Act of 1918, and the Canadian Migratory Birds Convention Act. The killdeer is a large plover, with adults ranging in length from 8 – 11 inches, having a wingspan of 23 – 25 inches, and weighing 2.5 – 4.5 ounces. It has a short, thick and dark bill, flesh-colored legs, and a red eye ring. Its upper parts are mostly brown with rufous fringes. It has a white forehead and a white stripe behind the eye. It is the only plover in North America with two breast bands. The rump is red, and the tail is mostly brown. The latter also has a black subterminal band, a white terminal band, and barred white feathers on the outer portion of the tail. In flight, a white wing stripe at the base of the flight feathers is visible. So, what about the name killdeer? During display flights, it repeats a call of “kil-deer” or “kee-deeyu.” When a plover is disturbed, it emits notes in a rapid sequence, such as “kee-di-di-di.” Thus, the name. The killdeer nests in open fields or other flat areas with short vegetation, such as agricultural fields and meadows. Nests are also sometimes located on roof tops. They generally breed close to where they bred the year before. The killdeer uses beach habitats and coastal wetlands and fields during the non-breeding season. It forages almost exclusively in these fields. When breeding, the killdeer has a home range of about 15 acres. Although generally a low-land species, it is found up to the snowline in meadows and open lake shores during its autumn migration. Following breeding, about 53 percent of the eggs are lost, mainly to predators. They start walking within the first day of life, and both parents will lead them out of the nest, generally to a feeding territory with dense vegetation the chicks can hide under when a predator nears. Both parents usually are present to successfully raise the chicks. The young fledge about 31 days after hatching. The killdeer has a life span of about 11 years. The killdeer feed on insects, especially beetles and flies, in addition to millipedes, worms, snails, spiders and some seeds. It will also take tree frogs and dead minnows when the opportunity presents itself. 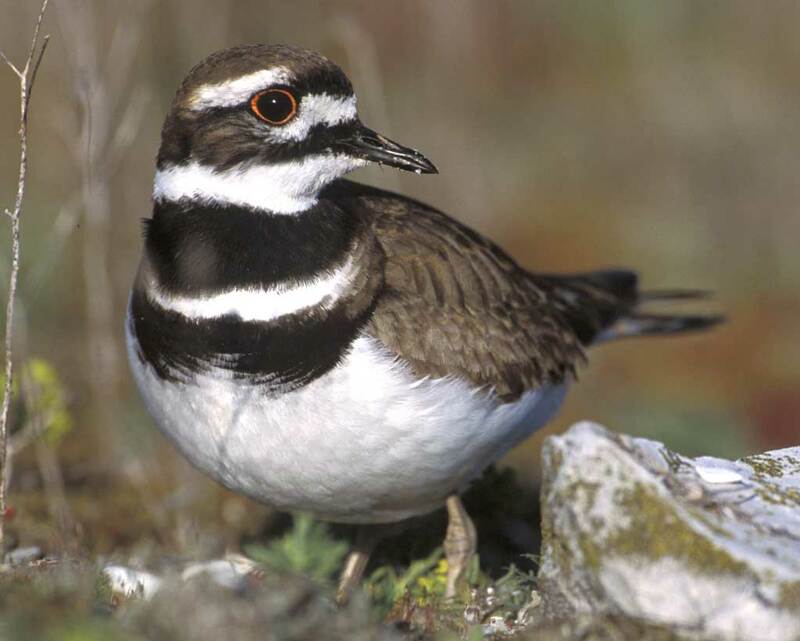 Killdeer can be found in all the continental United States, except Alaska, Canada, Mexico, into northern South America and along the west coast. They are also found in the Caribbean islands, including Cuba, Haiti and the Dominican Republic. According to Eli Bush, who named Killdeer Point on China Lake, the birds were spotted in that area in the late 1920s. Possibly, it was the large farm pastures of the Seward, Edson and Sinclair farms that attracted the birds to the area. The name has since stuck through the ensuing decades. The NFL Tennessee Titans were once the Houston Oilers before the move to Nashville. Name the current NFL team that was once called the Titans. http://townline.org/wp-content/uploads/2016/06/TownLineBanner-1030x206.jpg 0 0 Roland D. Hallee http://townline.org/wp-content/uploads/2016/06/TownLineBanner-1030x206.jpg Roland D. Hallee2018-11-28 16:10:392018-11-28 16:16:21SCORES & OUTDOORS: Just what, exactly, is a killdeer? A couple of weeks ago, while my wife and I made our semi-annual trip to my brother’s in Vermont, he pointed out to us all the pine trees that were a yellow-orange in color. We were on our way to Sunday morning breakfast when he asked me what I thought might be causing it. At first I attributed it to road salt – the state of Vermont is experimenting with a salt brine, which is supposed to be less invasive than the usual mix of rock salt and sand. But something that was peculiar about that is that it was not only trees by the road, but also stands of red pines deeper into the woods. That was curious. On our way home, my wife and I noticed that these yellowish-colored red pines did not exist in New Hampshire and western Maine. We figured it was a Vermont issue. I only bring this up because on my way home from work later that week, I noticed the same thing happening to a stand of tall red pines along Lakeview Drive, in China. OK, now we need to investigate. Here, in Maine, we have experienced a white pine needle damage epidemic for at least the last six years. The needles brown prematurely and drop very quickly, at least since 2014. I have witnessed that in my own backyard, a constant battle to keep up with all the fallen needles, year-round. That is caused by a brown spot needle blight. But what is causing the yellowing of the red pines? Craig Dusablon, landscape coordinator for the Vermont Agency of Transportation, said that road salt is the culprit, washing into the soil all winter long. A chloride concentration of just one percent can cause extensive plant injury, specifically in red and white pines. And it is not concentrated to trees by the roadside, it can also occur deeper in the upslope and downslope. Red pines, however, are a different species. They have straight trunks, often used for utility poles, with hardly any branches down low, but with a tightly packed crown. They often compete with maples, beeches and white pines for space, but fair much better on rocky ridges where other tree species can’t get a toehold. The signs of poor health are evident for years before the average red pine dies. The first signs of trouble appear on individual branches near the lower part of the crown, after which it spreads, with the needles slowly changing colors from a healthy green to a sickly yellow to a completely dry red that consumes the entire crown. Researchers are not prepared to pin the tree deaths on any one killer. First up, in turn that seems more relevant in light of President Donald Trump’s withdrawal from the Paris climate agreement recently, is climate change. The fact is, while there’s near consensus in the scientific community, that the planet is heating up, it’s much harder to pin down the exact impact on any particular species. There could be climate factors that can contribute to tree stress, considering the periods of drought we have experienced over the last several years. Though he won’t clear these suspected tree killers, or rule out the possibility that they may be working in concert to undermine the health of red pines, Simmons is really focused on a prime suspect: red pine scale, a tiny, near microscopic insect that crawls beneath the tiniest of bark flakes, injects its mouth into the tree’s vascular tissue, serving as a path for the distribution of food material, and begins to feed, sucking sugars and other metabolic products as the trees try to circulate them from the sun-catching needles to the rest of the tree’s body. The invasive insect was first discovered in Vermont in 2015. No one knows for sure what’s allowed the bug to spread into local forests, with climate change and human migration both possible causes. Since its arrival in the Northeast, it’s been wreaking havoc. It has the potential to wipe out a whole species from certain areas. 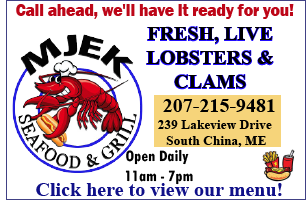 Though there is no known cure for red pine scale, officials hope to slow or contain it by removing infested trees, and encouraging the public not to transport wood that may contain the pest. When I was having my usual morning coffee and Danish last week following Sunday church, I happened to look up at a wide-screen television mounted on the wall of a local restaurant to notice an outdoor show. It was your typical show, sponsored by outfitters, outdoor equipment companies and the opinions of various “expert” hunters. The reason the show caught my attention was the way they were going about hunting. I remember the days when I was an avid hunter (my wife says I have since “lost the thrill of the hunt”), we used to have our favorite spots, get out early in the morning on a full stomach, brave the weather conditions and have great expectations for the outcome at the end of the hunt. It was the hunter vs. the hunted. A classic exercise in who could out think, out maneuver or outwit the other. It was wild game hunting at its best. You needed to possess the skills to pursue your prey in its own environment, both parties equipped with all the instincts Mother Nature provided. I can remember a couple of those adventures when the animal actually out-smarted me – something my wife says is easy to do (her opinion). I once followed a deer through the snow for many hundreds of yards, never catching sight of him, but I could hear him snorting up ahead of me, and hearing his antlers rattling against tree limbs. I followed him until we crossed our original tracks, and he actually passed through two conifers without disturbing a snowflake on the boughs. That was when I knew I was outwitted. Today, it just isn’t fair. Here, on this show, located somewhere in the Midwest, they had hunters gathering on game farms, splashed with deer urine scent like it was Aqua Velva, equipped with global positioning equipment, calling the deer with artificial devices. 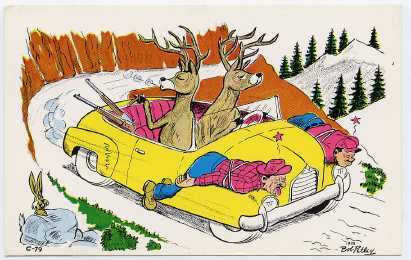 Once the deer was lured, they employed a computerized gauge to calculate the distance to the target, refer to another hand-held instrument to measure the direction and velocity of the wind before finally sighting in the prey. Mounted on top of their high powered rifle was a scope capable of seeing a gnat’s tonsils at 200 yards. The deer didn’t stand a chance. The only thing the hunters didn’t have were laser guided ammunition or “smart” bullets. After they dispatched the animal, they would break into a wild celebration. What’s with that? If, after the use of all that sophisticated equipment, you didn’t come home with a deer that was essentially caged, you should be embarrassed to the point of taking up bowling. The whole episode was like shooting fish in a barrel. So, I’ve decided that a money-making venture would be to make available to deer: human motion sensors, rear view mirrors, bullet proof vests, space-aged unpenetrable deflector shields a-la Star Trek, and laser guided bullet defense systems. After all, it’s only fair. Remember the old saying, “We believe in the right to arm bears?” Well, the same could be said about deer. Name the seven NFL teams with the initials of their cities on the side of their helmets.